1See BRYAN A. GARNER, THE ELEMENTS OF LEGAL STYLE § 7.8, at 193–95 (Oxford University Press, Inc. 2d ed. 2002). 2See id. ; see also THE REDBOOK: A MANUAL ON LEGAL STYLE § 11, at 215–24 (West Academic Publishing 3d ed. 2013) (stating “the trend today is toward plain language and away from the stuffiness and jargon-laced prose that characterized so much legal writing in the past” and recommending avoiding legalese); ANTONIN SCALIA & BRYAN A. GARNER, MAKING YOUR CASE: THE ART OF PERSUADING JUDGES § 44, at 113–14 (Thompson/West 2008) (recommending banishing needless Latin). 5BLUEBOOK, supra note 4, R. 7(b), at 83; see also THE CHICAGO MANUAL OF STYLE § 7.53, at 365 (The University of Chicago Press 16th ed. 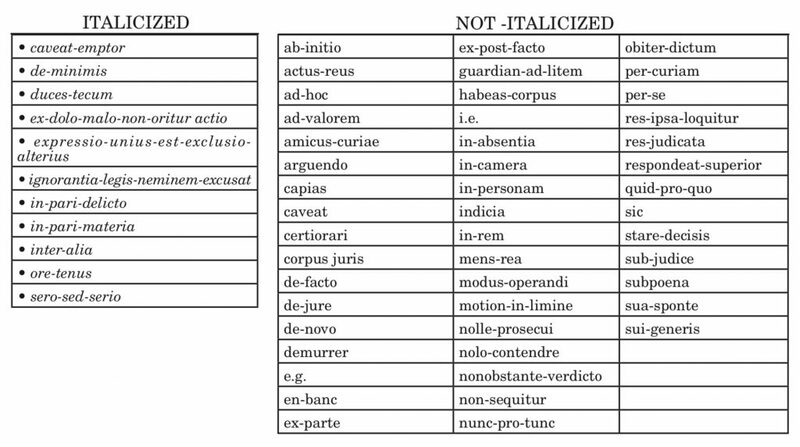 2010) (“Commonly used Latin words and abbreviations should not be italicized.”). 6BLUEBOOK, supra note 4, R. 7(b), at 83. 7See REDBOOK, supra note 2, § 3.3(a)–(b), at 80–81. 8Although “sic” is not provided as an example in rule 7(b) and is italicized in Black’s Law Dictionary, “sic” should not be italicized when used to indicate a significant mistake in a quotation per Bluebook Rule 5.2(c). See BLUEBOOK, supra note 4, at 77; see also REDBOOK, supra note 2, at 34 (“An interpolated ‘[sic]’ should not be italicized . . . .”). But see CHICAGO MANUAL OF STYLE, supra note 5, at 642 (stating that “sic” is “traditionally set in italics”).